I don’t buy a lot of ground turkey, but I just so happened to have a couple of pounds of it in my freezer from my friend Dallas. He’s the guy I buy my delicious heritage breed turkeys from each year, so I know his meat is flavorful, something that can be a challenge with commercially bred turkeys. 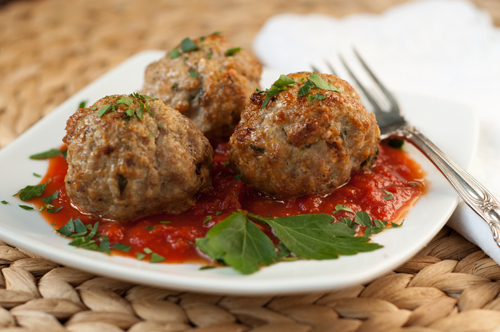 But even so, turkey meat is somewhat dry, and to make a moist turkey meatball takes a little finesse. In fact, I also think it needs another meat mixed in with it. Sorry – if I sucked you into this post thinking you’d find a turkey only meatball recipe, I’m just not that crazy about them! But when I get a half hog from my CSA farm each year, I ask for the ground meat as plain ground pork rather than sausage meat. I can make my own sausage easily enough with the ground meat, and this gives me more options of how I use it. It’s the perfect complement, in both flavor and fat content, to the turkey. Together, they make a beautiful meatball. And as Elise pointed out recently, you don’t need to have meatballs only with spaghetti. In fact, we had these with a savory spaghetti squash casserole as a side dish (recipe next week). Or just have a couple for lunch like I did this week – paired with your favorite sauce. I just discovered a jar sauce I actually like that’s from a local Colorado producer, Spinelli’s – the Fra Diavolo with Garlic is really good. Grab a jar of your favorite sauce, make these meatballs, and enjoy the best turkey meatball recipe I’ve ever made – thanks to a bit of the ol’ pig! Use a fork to combine meats without compressing it. Add all remaining ingredients except breadcrumbs and use the fork to mix it well, keeping the meat loose. Add breadcrumbs and bring together. Gently shape into 24 meatballs and bake at 350 degrees for about 45 minutes. Serve with sauce of your choice. There’s not much my boys like better than a big plate of meatballs so I’m going to have to give these a try. You’ve got my mouth watering. I can’t wait to make these. . . and paired with spaghetti squash, wow. I almost prefer turkey meatballs over the traditional anymore. I’d love to know how you make your sauce. Red sauce has been one of the harder sauces for me to get down right. Sara, I usually make my marinara with this recipe. Although I usually use two 28-ounce cans of tomatoes instead of fresh as fresh tomatoes take longer simmering to reduce. I have done this red sauce in lots of lessons and it is quite popular because it’s so simple yet flavorful. 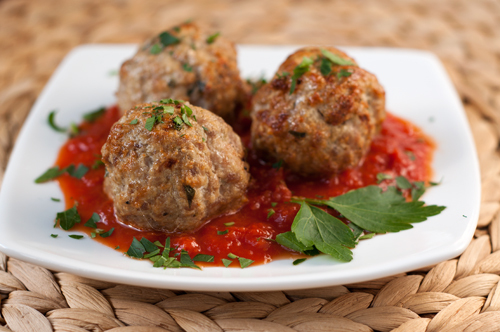 I agree, turkey meatballs on their own can be quite dry, love the idea of adding fresh pork to them, much tastier!